Ippudo is one of Japan’s top ramen shops and there was a hype when it opened in 2009. Even till today, there are often long queues during lunch and dinner. The founder of Ippudo, Shigemi Kawahara, is known as the Ramen King after three consecutive first place wins on a nationwide ramen-making competition where the top ramen chefs compete to create the best ramen. 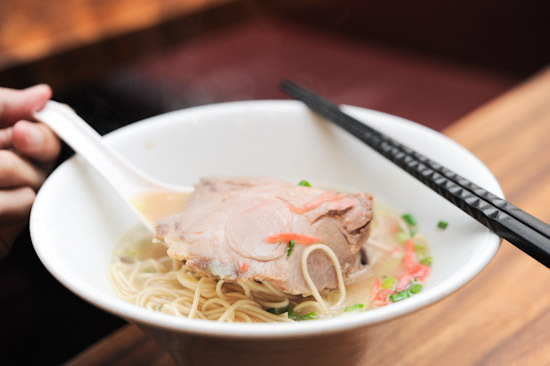 Does Ippudo ramen at Mandarin Gallery live up to the hype? Ciki and I were there for dinner on a weekday, and it was fortunate that we went early as there was a long queue waiting outside shortly after. Upon entering Ippudo, I was pleasantly surprised by the interior. Unlike the usual ramen places, the dimly lit restaurant at Mandarin Gallery, Orchard road has a modern and classy vibe. Besides ramen, Ippudo’s menu also has other side dishes like Agedashi Tofu ($10), Gyoza ($6), Chashu Hotplate ($8) and Tonkotsu Croquette ($12). After a quick glance at the menu, we ordered the classic Shiromaru Motoaji ($15) – original recipe tonkatsu soup served with Hakata-style thin noodles, rosu chashu, cabbage and spring onion; and Karaka-Men ($17) – Ippudo pork broth with special spicy miso and ground pork. The chashu, oh the chashu. At Ippudo, the Shiromaru Motoaji ($15) comes with a gorgeous piece of rosu chashu (pork loin). The Hakata-style noodles are springy and delightful, while the broth is refreshing and very addictive. It is one of those moments where you find it hard to explain how something so simple can taste so delicious. The Karaka-Men ($17), on the other hand, has a spicy kick to it and is no less addictive than the Shiromaru. Like other ramen shops, Ippudo has its own regulars who swear by it and visit on a regular basis to satisfy their ramen cravings. While there are also others who felt that it is overrated and not as good as the one in Japan. I think it all boils down to knowing how to manage your expectations. Ippudo has always been known as one of the best ramen shops in Japan, and this probably explains why some people go there with ridiculously high expectations and end up being disappointed. For me, there is no doubt that Ippudo at Mandarin Gallery is one of the best ramen restaurants in Singapore. The question is, are you willing to queue up for it? I think until today i still can’t get used to the noodles they use. I always seem to prefer those curly egg noodles like those from Santouken at Central and Sapporo Ramen Miharu @ Gallery Hotel.. Anyway this looks and sounds great, I will try it! ippudo @ new york is wayyy better. but more importantly, where is the pretty plate of food on the top of your website from? emily: it’s from Jaan. I had a really good meal there, go try ok! Had a great time out that night- Thanks for the hospitality buddy;) My post should be up soon too yo. Hazel: since when Ippudo has a branch in Takashimaya? Perhaps it’s Tampopo you are talking about. I personally prefer Hakata Ramen over the fat curly ramen. Not so gelat. I’ve tried Ippudo in Fukuoka before, nothing can beat the original. But I can still settle for Ippudo here if I crave a bowl of Hakata Ramen. It’s actually good but overrated. I don’t think it’s worth the long queue. I would rather go to Yoshimaru Ramen bar at Hollad V.
You should go down to Ramen Champion at Iluma! hi, have u try Tonkotsu King ramen at Tanjung Pagar?? I must said this ramen is more delicious than Ippudo!! the best ramen I ever had!!! u should try and give a shot for that.. The first time I went Ippudo, I already think that its not good at all. When I went to Tokyo after that, I hesitated to try it but nevertheless, I did and it so much better!!! I still miss that store in Ikebukuro. uh have you not done a review from lawry’s? just round the corner and so so so much better! The origin of this shop is Fukuoka, and it was opened on March 14th, 2014. Hakata Ippudo was founded 1985, and it spread all over the world such as New York, Singapore, and China. Ippudo has not only pork taste but also soy sauce and miso taste (some do not have these, so it depend on each shop! ), so you can enjoy comparing eating each ramen. I knew only the name of this shop, but I never went to it because it is in Chiba and my house is far away from it. However, I found it in Lalaport by accident, so I visited there for the first time. The interior of it is very clean and simple because of its newness, so I think it different from ordinary ramen shop, and it makes women come to it easily. I really love ramen that is light taste, thin noodle, and this shop have all of these! I was very surprised and fill. I had Shiromarumotoaji, which is original noodle and tonkotsu taste, with ordinary hardness (you can choose the hardness of noodle!). In addition, you can add an egg if you want to, but not for free. Also, you can refill your noodle from two sizes(small is ?70, big is ?120). Cost is reasonable, but the size of shop in Lalaport is small, so you may have to wait if it is lunchtime or dinner time.